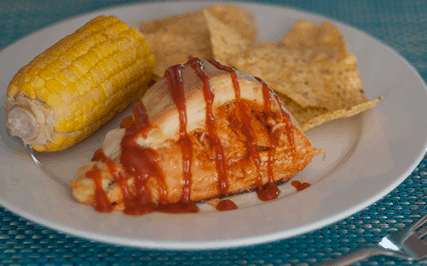 This BBQ pulled chicken sandwich bake is perfect for a weekend dinner. Comfort food at its finest. Welcome! 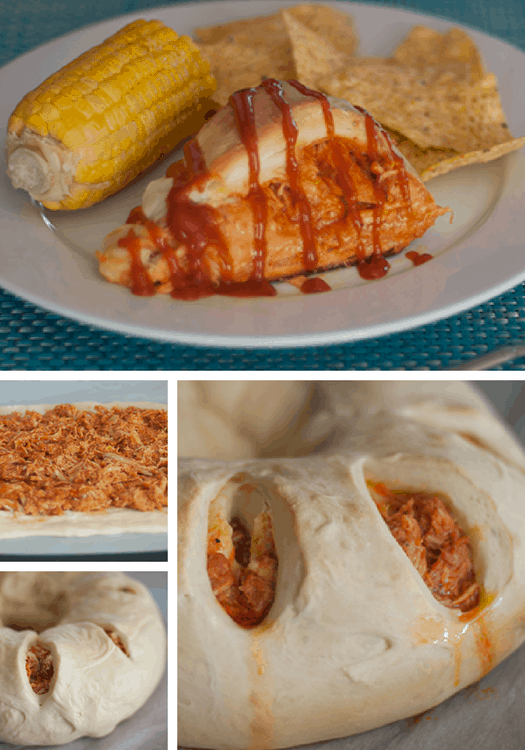 This recipe for a BBQ pulled chicken sandwich bake is inspired by a delicious sandwich at Rosa’s Pizza in Bozeman, Montana. If you are ever in Bozeman – you need to stop by and try their BBQ Chicken Chuckwagon sandwich (or any of the Chuckwagon sandwiches). Their pizza is delicious too. Both the BBQ Chuckwagon sandwich + a family favorite breakfast bread called tea ring fused together is really where this idea came from. The dough is the same used in last week’s recipe bread machine buns. 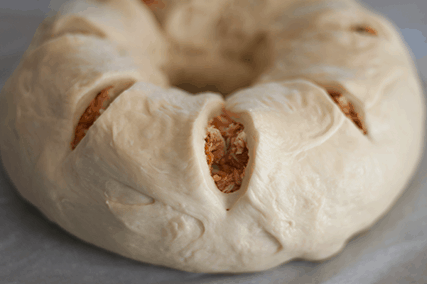 The sky is the limit for what you can make with this delicious bread dough recipe! This recipe is great for a Sunday dinner with the family. Or serve for special company. Yes, there is a lot of time involved. But most of it is wait time! 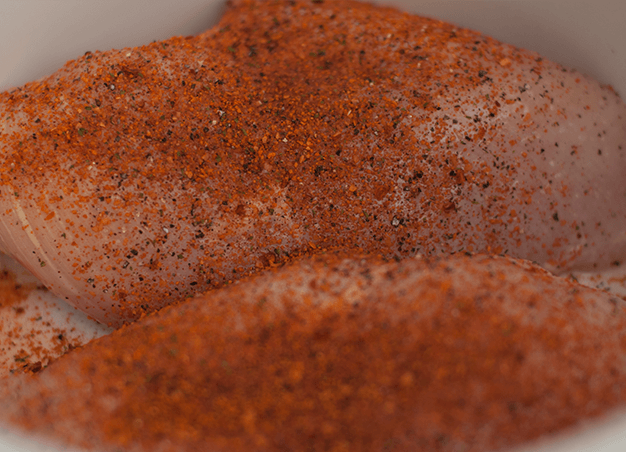 Start by adding two boneless skinless chicken breasts to your slow cooker. Season with salt, pepper, and McCormick’s barbecue seasoning. Add a little bit of water. Cook on low for about 4 hours. Check occasionally to make sure it’s not drying out. The chicken should be easy to shred at that point. Pull chicken apart using two forks. Add the sauce to the shredded chicken. Cook on low for a least another hour. Then turn off the heat and let the bbq chicken cool. Use the dough/pizza dough setting on your bread machine. Press start. 🙂 The cycle should be about 90 to 100 minutes. Once the bread machine dough cycle is complete, let the bread rise to the top of the bread machine pan. 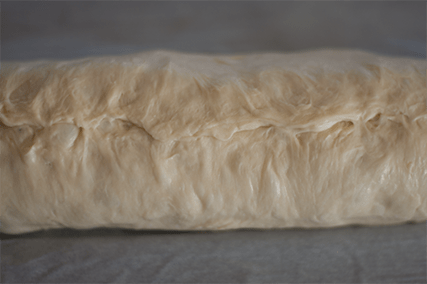 Once the bread dough is done rising, prep an area with parchment paper. Grease your hands with butter. Spread the dough to the size of a 13 X 9 pan. Top with a thin layer of shredded chicken (in BBQ sauce). Roll the dough up from long end to long end. Pinching the end to the rest of the dough. Then make into a ring. Pinching the two ends together. Make slits in the top of the ring about 2 inches apart (with a kitchen scissors). Bake at 350 degrees for 22 to 25 minutes. You want it to be golden brown on the top and the bottom. Check one of the cutouts to make sure it is cooked thoroughly. Serve warm. 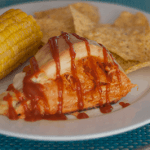 Cut into slices and drizzle with barbecue sauce. Serves about 8 people. Please stop by and say hi in the comments! This recipe is perfect for a Sunday dinner. Or serve for special company. 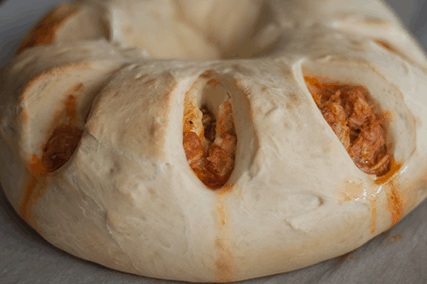 Shredded chicken in barbecue sauce topped with shredded mozzarella cheese — baked in a homemade bread dough ring. 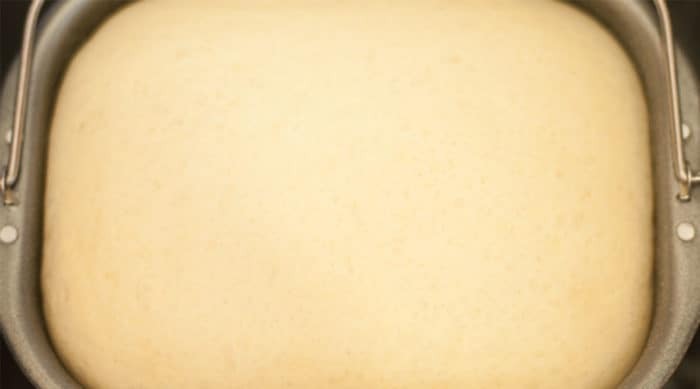 Use the dough/pizza dough setting on your bread machine. Press start. The cycle should be about 90 to 100 minutes. Prep an area with parchment paper. Grease your hands with butter. Important – you don’t want the chicken to be too warm or it will make your dough really hard to work with. You also don’t want it cold because it will increase the cook time of the dough. Then make into a ring. Pinching the two ends together. Make slits in the top of the ring about 2 inches apart (with a kitchen scissors). Bake at 350 degrees for 22 to 25 minutes. You want it to be golden brown on the top and the bottom. Check one of the cutouts to make sure it is cooked thoroughly. Serve warm. Cut into slices and drizzle with barbecue sauce. Yes, there is a lot of time involved, but most of it is wait time!